2019 Schedule has been released! $7000 purse courtesy of Rod End Supply! •Top 5 farthest pulls receives a $100 gift card from EMI/Speedway Motors! Quick updated stats on the 2017 season for the MMSA Series! Over $18,000 paid out to date to drivers!! then off to the newly remodeled Thunder Valley Speedway in Salem for the Wednesday night fair date! Next Race May 6th Twin Cities ! The Hoosier Speed Invitational of Champions May 14th. On April 29th the World of Outlaws was rained out at Tri State Speedway. That race has been rescheduled for Sunday May 14th. Tri State Speedway reached out to the Premiere Support Series and challenged us to put on an event that would be appropriate to team up with the legendary WOO! Unfortunately we have been limited to a 18-20 cars due to time restraints and requirements that it takes to put on the Greatest Show on Dirt. We sincerely apologize for this but it is simply out of our control. "Hoosier Speed Invitational of Champions"
The top Lightning Sprint Drivers and Teams will be invited to participate in this special event.. This is not a points event, and this event will be formatted special. Car regulations still must fit into the USAC Lightning Sprint Rule book. With loyalty to the MMSA series members, a minimum of 10 MMSA drivers will be guaranteed into the 20 car grid. The drivers leaving LPS on Saturday the 13th that are in the top 10 positions of points will be rewarded a spot in this special event. The other drivers will be comprised from all over the country in the form of Champions, past Champions, notable race winners, and possibly a few WOO drivers themselves. We realize this event is on short notice however we will not leave spots un-filled. Invitees will have 48hours to make contact with series. We will go to the next round of Champions after 48hrs. Invitations will be listed on the MMSA and Hoosier Speed Facebook pages as well as the respected home pages. The first names will be announced Monday May 1st. Good Luck to all and see you at the races. The first race is history! The weekend wrapup! Opening night of the MMSA series has come and gone. It was refreshing to me, the smell of racing fumes, the first night out having a respectful car count of 25 mini sprints on hand at Brownstown. Although this is race one of 27, I whole heartly feel that with 25 of the best mini sprints, we will see this number grow as several racers just were not quite ready yet. Seeing two sets of hot laps to start the evening, speeds were in fine shape. Some teams unload with the right setup would show greatly in hot laps. Some had to return to their trailers for major changes. For some the hot laps ended their evening, including the Henchcraft , EMI 10D of Drew Dorsett had mechanical issuses that would sideline him for the evening. Also the 45 hot rod of Brandon Griffitts would take on the same feel ,of parking it for the night due to electrical issues. The final hot lap victim was the 76H of Mike McIntosh had injector issuses. Heat one rolled onto the racing surface , with 9 cars to start, but the fore mentioned hot lap victims were to be in heat one, therefore heat one was cut to 6 cars. Not be overlooked still had some top quality cars to battle for the first heat win of 2017. The hot shoe from New Palestine IN, Danny Fitzgerald piloting his OSR Racing engines entry, would take the first checkers followed by Mike Miller, Cindy Chambers, Keith Arvin, Cory Meadows, and young Korbyn Hayslett. We will hear more on Danny here shortly. Heat two had 8 cars take the green, seeing second year racer Kyle Hathaway lead at the green for a few laps, till the Hoosier Speed entry driven by Andy Bradley would take full control over the race by lap 3. Hathaway would finish second followed by, last years sportsman of the year Brandon Smith, Bradley Ashford, Dean Parker, Jessie Vermillian, Dustin Griffits and Bob Griffits. The third and final heat also had 8 cars to hit the track running, but only 7 would finish. The Ohio Bandit, Ty Tilton was on a rail with his sight set on the checkers in a hot battle with 77 Justin Lewis when Tilton's Benic Shocks, Hyper Racing entry went down on power with just a lap to go. Thus allowing young Lewis to take home the heat win, followed by Rod Henning, Cody Trammell, Tim Light, Colin Miller, Blake Vermillian, Luke Easton and Ty Tilton. With a few scratches for the night, the MMSA series decided not to run a B-main, instead would start the balance of entries, 22 strong for the 20 lap A-Main. The feature rolled off the starting shoot with Kyle Hathaway leading the field to the green. Hathaway benefited from the point inversion that put him on the pole, and having the 6th starting spot to the passing point leader for the night Danny Fitzgerald. Taking the green flag, almost all cars got through turns one and two with the exception of two. Getting the worst was the 73 of Blake Vermillian geting turned and bouncing off the tractor tire putting him on his lid. They would clear the track and racing would continue. Hathaway would bring them to green for a second go around. Kyle would lead lap one with Henning, Smith, Lewis, and Bradley in tow. 12 laps down 8 to go, once again seeing the top 3-4 checking out, but we would lose one of those 4, Danny Fitzgerald would push it to the limits in turn four and laying his machine over on its side. He would restart last and still finish a respectful 8th. The final restart would be Bradley, Henning, and Lewis with a handful of laps left the top three flat out got it on. Running down the back of the field in 4 laps, the race would get very exciting for the final two circiuts. Bradley was focused on the low line Henning and Lewis battleing the lap traffic on the middle of track. This left the top line open for the last lap of dash to the finish, with lapped cars abroad Justin Lewis went for broke passing the Henning machine with one lap to go. His focus was on the leader Bradley one car length in front, coming to the checkers Lewis had a run on the highside out of 3 and 4 but Bradley nibbed him by a wing! The race took 21 minutes, 3 yellows and 2 reds would fly! Next race will be Friday April 14th at Bloomington, non wing style then Saturday April 15th at Lincoln Park with the tin tops back on! 2017 Kicks off at the Legendary Brownstown Speedway! Bloomington Speedway has played host to some of the best dirt racers in the business, in the back woods of Kinser country this 1/4 mile oval not only boast one of the best surfaces in Indiana it also usually has a packed grandstand. 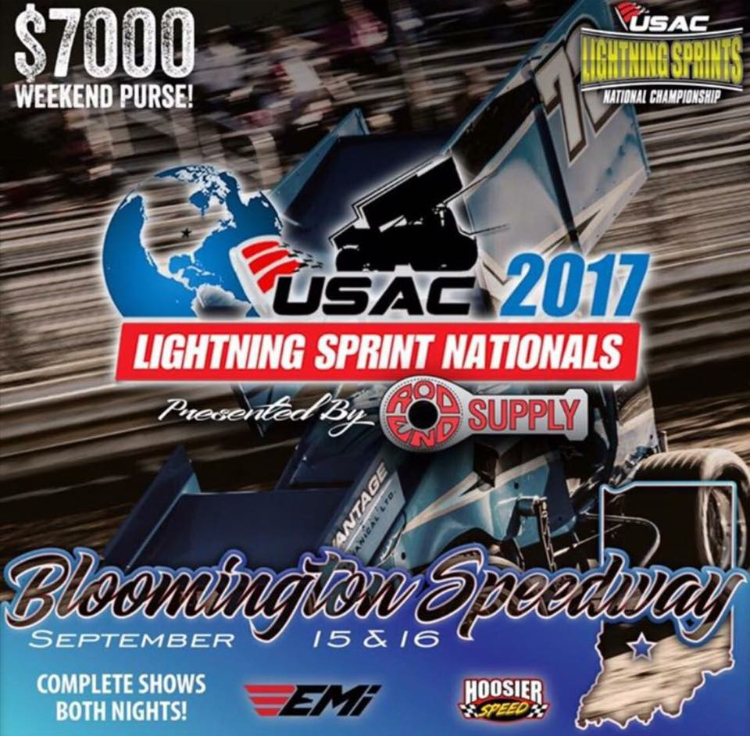 The MMSA will visit Bloomington Speedway four times in 2017 two of those dates back to back for the second annual Lightning Sprint Nationals brought to you by Hoosier Speed and Speedway Motors! Another great historical venue, built in 1952 and known for some of the best dirt late model shows. A wide two groove Brownstown Speedway is hard to beat, covered grandstands and some of the best cheeseburgers on the MMSA tour. Another prestige stop on the MMSA schedule, the tacky surface is measured at 5/16th of a mile but plenty of room for action packed racing, this central Indiana track has earned its rank as one of the best since its conception in 1969. The MMSA tour will go back to its roots and back to Salem's Thunder Valley Speedway in 2017. The MMSA last visited TV in 2008. This 1/5th mile will prove to be daunting as our racers take off the wings for three great events. Another historically stop for the MMSA tour, this paper clip shaped track explains what Indiana Sprint Car racing is all about. Many open wheel heroes have cut their teeth on this slick 3/8th mile facility. Not many things have changed at Paragon over the past 35 years, that means they are doing something right! Tri State Speedway "The Class Track"
Prestige and Professionalism are the only words that describe Haubstadt's Tri State Speedway. With the best promotional and track prep team known in the business the Helfrich family has owned and operated this track since 1957. The engineered surface provides some great traction, mixed with wide turns provide some excellent wheel to wheel action. The "NEW" Twin Cities Speedway was purchased over the off season with an eager track owner and a well established track promoter, Twin Cities will return to greatness in 2017. Tim Keithy who once pulled Brownstown's Speedway from the ashes has joined this new team in building the new Twin Cites. Many improvements have occurred during the off season including new clay, new pit offices and many improvements in safety. 1/5 mile slightly banked oval, tight quarters provides a challenge for even the most talented drivers. Grass roots racing at its best! A wide flat facility, and a 1st for the MMSA Tour. This non USAC winged events should be a great show for the fair crowd! We have fielded some calls over the past few days, and we want to clarify some things. Success of our group is partly due to the enforcement of our rules, and mostly due to the great group of racers we serve. We will continue to strive to keep the MMSA the premiere support series in Indiana. We do want to remind that racing with the MMSA is a privilege not a right. We welcome all , however compliance to the MMSA rules and procedures set forth is non-negotiable! We have something great here and we have no desire to change it. The basis of an economical racing group relies on the enforcement of the rules and procedures. Here are some topics that have been recently discussed. A) You do not have to be a USAC member to race in USAC co-sanctioned events. You simply don't receive USAC points. B) If you don't want to race for USAC points and you want to run American Racer tires on USAC nights that is also approved. You simply won't occur USAC points. However you still get MMSA points. C) Engine sealing is for your benefit! It not only helps you get out of the track faster after the races it also keeps you from in most cases getting your engine torn down at the track*. D) It is at the Competition Directors discretion if an engine needs to be torn down to be inspected. E) The Competition director will target engines for further inspection if they have not been sealed and finish in the top three, three or more times. This includes races from 2016. That is correct we do profile. F) If your engine is sealed and you are protested by another racer your engine will be torn down. You have the option to have have it done at the track or be escorted to Watson Racing in Greenwood, Indiana. Other mutually agreed upon locations will be allowed. If your engine is found legal you will receive the $500 protest fee. If your engine is sealed and you are found illegal penalization will occur depending on severity, your membership may be revoked. If you refuse inspection your membership can be revoked. G) If your engine has been sealed and the Competition Director deems it necessary for your engine to be torn down and resealed. This will be handled under the same terms of a protest. The racer if found legal will be paid $500. If the engine is deemed illegal the same penalties will apply from above. H) Engine sealing is free, you just need to bring your own head gasket. Engine sealing can be done at anytime. I) Normal tech will usually include but not limited too, bore and stroke check, head runner inspection, transmission check. Safety inspections, seat belts ect. J) During normal tech you may be asked to remove, spark plugs, injection, and engine covers, this includes valve covers. This includes sealed engines. K) Any and all on track calls are made by the hosting track. MMSA officials may penalize but will not overturn on track calls. We kick of 2017 at the Legendary Brownstown Speedway! Thanks for being part of the Premiere Support Series! 2017 scheduling is under way! MMSA will participate in the USAC National Lightning Sprint Championship in 2017! Payout has been posted on the schedule page.